Caption For the past 30 years the Nihonmachi Street Fair has been a platform where Asian and Pacific Islander community nonprofit organizations participate in to raise much needed funds and spark awareness. 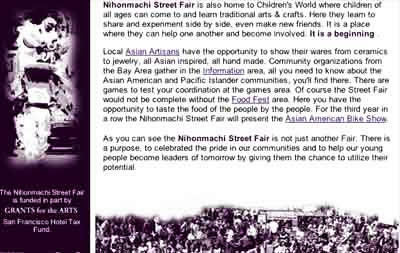 The Nihonmachi Street Fair is an important outreach tool that has continued to serve these communities. From AIDS awareness senior care children and youth programs and newcomer programs there is an abundant resource for the public to take in. The Street Fair staff and committe is comprised of all volunteers that are dedicated to continuing the spirit of giving back. Encouraging our youths to carry on that volunteer spirit in everything that they do. It is also a venue where local musicians and performers have the opportunity to express themselves. We especially encourage the talents within our communities. By mixing tradition with the present we hope to learn and discover. Headline AUG: Celebrate the diverse Asian community in the Bay Area.